Ping Pong markets itself as brandishing “little steamed parcels of deliciousness,” and they’re not far off. However, if you came looking for little Chinese grandmothers pushing carts of delicately-wrapped mystery meat, you’re in for a surprise. Ping Pong Dim Sum is a more modern take on the Chinese cuisine, which is actually most often served for breakfast. In Hong Kong, restaurants start serving dim sum as early as five in the morning. Also unlike traditional dim sum, vegetarians can leave Ping Pong Dim Sum well fed. 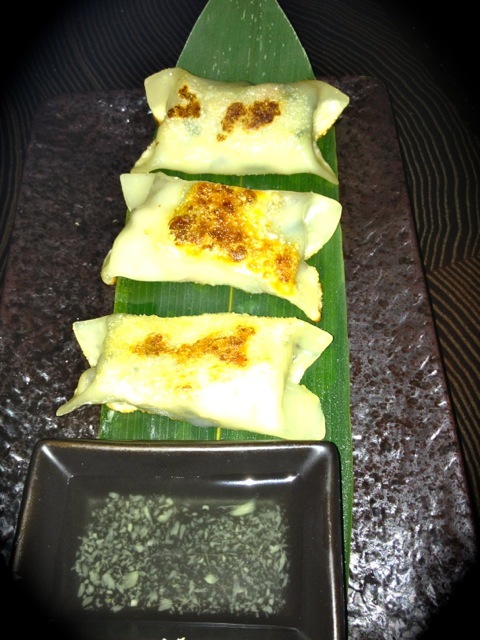 Especially if they sample the Best Thing on the Menu (BTM): Spicy Basil Dumplings. They fall under the “fried and griddled” category on the extensive dumpling menu with the description of “basil & chili with rice noodles in wheat flour pastry, with vinegar dipping sauce.” Who doesn’t love a carb stuffed with a carb? Doesn’t every country have a version of this winning combination, such as potato pierogies? Another tip: See if you can trick the server into letting you keep the tasty vinegar sauce for the rest of the meal. Other favorites at Ping Pong include the honey roasted chicken puff and the char sui bun. But, chances are, you would have found your way to these items on your own. Spicy Basil Dumplings not your BTM? Share your favorites in the comments section. This entry was posted in Restaurants and tagged Best Thing on the Menu, BTM, Deliciousness, Dim Sum, Dumplings, Ping Pong Dim Sum. Bookmark the permalink.